After the staggering success of The Avengers, it seems that every studio wants a piece of the action. And Fox in particular. What they do not seem to realise is the Marvel megahit made gazillions at the box office not merely because it put together a bunch of superheroes, but because it found the golden formula for some great group chemistry and banter among all the CGI action, which made it enjoyable not just for fans or even casual cinema-goers, but even for those who rarely even go to the cinema. 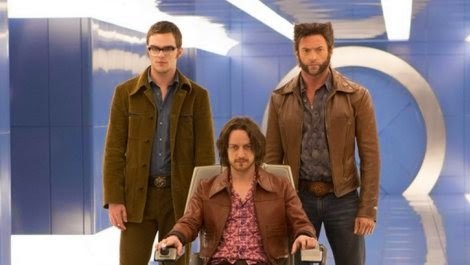 After the pathetic attempt of making the Spiderman rebooted franchise an ensemble film, there comes the X-Men, which, at least, was always meant as a group. X-Men: Days Of Future Past is a strange beast, which proved entertaining enough when I finally caught up with it, yet whose facade has sophistication has crumbled in my mind. With its complex narrative involving time travel, a large group of characters and historical events weaved in, as well as its melancholic mood, this new sequel shows how far we have gone since the first X-Men. (In an intriguing twist on the recent "every single moody superhero film MUST look like a Terrence Malick film" trend, here it is the score of The Thin Red Line which is used here in the trailer). And yet, while thoroughly enjoyable, you quickly realise that the film has its problems, an impression which grows more and more after viewing it. First of all, why introduce so many new mutants and do nothing with them (apart from Quicksilver but his screen time is too short!). All the more frustrating since some intriguing new actors (Fan Bingbing, Omar Sy...) were brought in yet they are throughly wasted. And poor Ian McKellen (as older Magneto) and Halle Berry, with mere cameos and who seem to have been called back simply to put some familiar names and faces on the posters. If anything, the film is actually misselling the group dynamic as fewer mutants truly matter in the plot compared to previous films in the franchise. The young version of Magneto and Mystique are the leads and everybody else is just a supporting character in the story arc. In a variation from the comic books storyline, it is Wolverine who is sent back in the past. Yet he is largely a plot device and actually has very little to do in the film of any consequence apart from getting the action going. His own backstory does not matter one bit, and any other mutant could have taken his place without the story changing much. But for all its perceived narrative boldness, Bryan Singer does not really cover any new grounds, with the historical events integrated to the storyline proving merely decorative. So yes we get it, the war between mutants and humans is bad, it's the same story since the first film. It is even a step back as X2 had a more interesting angle on the subject, and this time around there is not even the slight but real social subtext from the first film. I won't ruin the ending but I couldn't help thinking the Days Of Future Past storyline was adopted following a certain agenda as to where the producers wanted the franchise to go (and not to go), after some slightly disappointing box office result for X-Men: First Class. As a final note, I am still left wondering what is the score with the weird colour palette? It looks like it was inspired by the jelly popping candy shells from Cadbury in their new chocolate bars, the same muted yellow, blue and pink? !